Now that the weather is warming up, horse owners are starting to spend more time with their horses, and are looking forward to even more enjoyable riding weather. There are some nutritional concerns, however, during spring and some management issues we should address to ensure the health and performance of our horses. First, as we start working our horses more, we must increase the plane of nutrition to ensure that the horse’s increased requirements are met. Energy is possibly the most important nutrient to consider in a working horse. As a horse works harder, its energy (calorie) requirement increases, and we must supply those additional calories in a form that will not compromise the horse’s digestive health. We can add more calories by increasing the amount of feed offered daily to the horse. However, in general, horses should not be fed meals larger than 0.5 pounds per 100 pounds of body weight, especially when feeding oats or a feed with high grain content. Grains such as oats and corn are high in starch and sugars, and when fed in larger meals may increase the risk of digestive disturbances such as colic and/or laminitis. Alternate energy sources include fat and fermentable fibers. Feeds such as Purina’s Ultium® Competition, Strategy® Professional Formula GX, Strategy® Healthy Edge® and Omolene #500® horse feeds are higher in fat and fermentable fibers, and lower in starch/sugars than traditional grain mixes and sweet feeds, therefore are excellent feeds to increase the calories in a working horse’s diet. Omolene #200® horse feed is also an option for these situations, with the calories supplied by a combination of fat and soluble carbohydrates. These performance feeds also contain all the essential amino acids, vitamins and minerals to support the increased demands of the performance horse. Keep in mind that all feeding changes must be made gradually, so it is important to slowly increase the amount of feed as the horse’s work load increases. If you are only planning to work your horse lightly or your horse is naturally an easy keeper, a concentrated feed such as Purina®Enrich Plus® Ration Balancing Feed may be the best way to meet the horse’s nutritional needs without adding many calories. If your horse stays in good body condition (not too fat or too thin) on hay or pasture alone and doesn’t need additional feed for more calories, feeding one to two pounds of Enrich Plus® per day will provide the protein, vitamins and minerals that the horse needs to meet essential nutrient requirements.Next, we need to keep in mind that the forage portion of the horse’s diet may be changing, and we must be aware that these changes may be problematic for some horses. For many horses, the advent of spring means that the source of forage changes from hay to fresh grass. Most horse owners are well aware that an abrupt change in feed puts a horse at risk for laminitis. However, they don’t always realize that a change from eating dry hay to grazing lush pasture is a very big change in the diet for the horse’s digestive system. This change from hay to pasture should be made gradually to minimize the risk of laminitis as horses are exposed to fresh pastures. Why can fresh grass cause laminitis in horses? First, there is a big difference in the quality of fresh forage horses will graze in a green pasture compared with any forage harvested for hay. Simply changing the diet abruptly can create problems for the horse’s digestive system. In addition, the green grass horses graze is often higher in sugars than the hay. During the process of photosynthesis, plants manufacture sugars which the plant used to fuel growth of the plant or store as starch or fructans. The storage form of the sugars depends on the plant species (cool season grasses tend to store sugars as fructans, while warm season grasses tend to store sugars as starch). These sugars can accumulate in the spring when there are sunny days and chilly nights because the plant produces the sugar during the sunny days but doesn’t grow in the colder temperatures at night. So, the sugars don’t get burned to fuel growth, they just begin to accumulate. This can cause problems for horses, especially when the sugars are stored as fructans, because fructans are mostly digested in the hindgut through microbial fermentation. Excessive fermentation of fructans in a horse’s hindgut may be a possible trigger for colic and/or laminitis, similar to a grain overload reaching the hindgut. The fermentation of fiber carbohydrates in the hindgut is normal, and does not increase the risk of digestive disorders in the horse. Other environmental conditions such as drought, stress, duration and intensity of sunlight, salinity (salt content) of soil, and overall health of the plant can contribute to excess storage of sugars and/or fructans. How then do we manage pasture turnout and grazing to minimize the risk of laminitis? Horses that are kept on pasture year-round usually adjust to the new grass as it grows. Nature does a fairly good job of making the pasture changes gradually. Problems are most likely to occur when horses have been confined and fed a hay and grain diet during the winter, and are then abruptly turned out on the lush green pasture in the spring. Further, horses that have been kept up through the winter may overeat when turned out because of the high palatability of lush green foliage. This sudden change in the diet, especially when it includes a rapid influx of unfamiliar fructans into the hindgut, may trigger digestive upset. There are several ways to prevent or minimize problems when introducing horses to spring pastures. 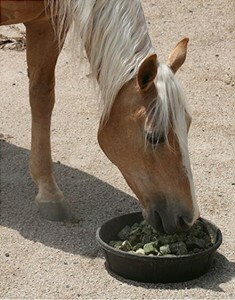 Feeding hay immediately before turn-out may help keep horses from overeating, since they are less likely to overeat on an already full stomach. Restricting grazing time will also help minimize risks, and turning out in the early morning may help minimize the amount of sugars in the pasture at that time. A suggested schedule is thirty minutes of grazing once or twice a day on the first day of grazing; then increase grazing time by 5-10 minutes per day until the horses are grazing 4-6 hours per day total. At this point, they have adapted to the green grass. One final consideration when getting back into the saddle is the condition of the horse. On that first warm sunny day, it is very tempting to head out to the barn for a nice, long trail ride to enjoy the great weather. However, if you have not been riding your horse regularly through the winter, your horse is not conditioned for that type of physical activity (and possibly neither are you!). To prevent muscle soreness, and possibly “tying-up”, horses should be gradually reintroduced to work. Start with slow, easy work and short workouts, and gradually increase the intensity and duration of the workouts until your horse is adequately conditioned. This will help decrease the risk of problems and injuries in your horse. It may take up to 90 days to get a horse properly conditioned for strenuous physical workouts. Once your horse’s nutritional and management considerations are addressed, and your horse is adequately conditioned for the desired workload, you are ready to head out and enjoy the warmer weather and sunshine. This entry was posted on Tuesday, March 26th, 2019 at 12:47 pm	and is filed under News & Updates. You can follow any responses to this entry through the RSS 2.0 feed. Both comments and pings are currently closed.